THIS JUST IN: "New England Revolution midfielder Shalrie Joseph has been granted an indefinite leave of absence from the team to attend to personal matters. He left the team on Saturday, April 24, and will return at a later date." Inter Milan retake the lead at the top of Serie A with a win and a Roma loss, while the other top 4 league leaders remain the same as we head to the finish - Chelsea, Bayern, Marseille & Barcelona. Jozy Altidore got a Red Card, and Rico Clark got his German debut in a very eventful weekend of goods and bads for Americans in Europe. See the section below. Jose Torres and Pachuca pulled off a miracle and qualified for the Mexican Primera Liguilla (playoffs) for spring 2010. Join us on Twitter: @dunord - Come on follower #1100. Manchester United 3-1 Tottenham Hotspur - #2 v #4 as Man U stays in the hunt, and Spurs will now get a dog fight for the last Champs Lg spot. Arsenal 0-0 Manchester City - #3 v #5 sees Man City drop behind Aston Villa to #6. Barcelona 3-1 Xerez - #1 v #20 ended just the way it was supposed to, with Barca playing the 2nd string no less. Palermo 3-1 Milan - #5 v #3 all but killed Milan's chance at the title. Roma 1-2 Sampdoria - #1 v #4 became #2 and #4 as Inter retake the league lead. Alessandro Del Piero: "Yes, it's true. This summer I'm going to the USA .... On holiday." Steve Cherundolo will be in a MLS team uniform when the summer transfer period ends. Toronto FC drew 18,394 for their Sunday game against Seattle. Is that their first ever non-sellout?!?!? Maybe not, but the honeymoon is over. On the other hand that may help as now they won't have to constantly be playing on honeymoon legs. Simon Kuper of the Financial Times writes that Barcelona is where Jose Mourinho really got his start and came into his own. Now Barca fears him. @JozyAltidore17: I'm so sorry about yesterday. Made a stupid, immature and costly mistake. I apologize to hull city and the fans who I let down. I let my emotions get the best of me and lost my composure. Believe it or not this year playing for hull was to date the best trip I've ever been on. Jonathan Tannenbaum of Philly.com reports on a bus of Philadelphia Union fans getting a rain of rocks supposedly from some New York Red Bulls fans that broke 3 windows. Idiots are everywhere. FC Dallas 2-2 Seattle Sounders FC - FCD goals both by Jeff Cunningham(both via PK). SSFC goals by Steve Zakuani & Fredy Montero. New York Red Bulls 2-1 Philadelphia Union - NYRB goals by Salou Ibrahim & Juan Pablo Angel(PK). PU goal by Sebastian Le Toux. New England Revolution 1-2 Colorado Rapids - NER goal by Marko Perovic. CR goals by Mehdi Ballouchy & Pablo Mastroeni. Columbus Crew 1-0 Real Salt Lake - CC goal by Guillermo Barros Schelotto(PK). Chicago Fire 2-0 Houston Dynamo - CF goals by Barrio Husidic & Peter Lowry. Chivas USA 3-2 San Jose Earthquakes - CUSA goals by Sacha Kljestan, Justin Braun & Chukwudi Chijindu. SJE goals by Chris Wondolowski & Steven Beitashour. Toronto FC 2-0 Seattle Sounders FC - TFC goals by Dwayne DeRosario & O'Brian White. DC was off this weekend. All 16 teams will be in action next Saturday. Dwayne DeRosario was named MLS Player Of The Week. -I would have gone with Marco Pappa personally. Steve Davis of Sports Illustrated always has the best analysis from MLS games, and here is his Five things to take away from Week 5. Kyle McCarthy of Goal.com with his Monday MLS Breakdown, focuses on Conor Casey and other USA forward hopefuls, plus 11 questions, thoughts and answers. Jeff Carlisle of ESPN Soccernet with his Week 5 Wrap Up. Ridge Mahoney of Soccer America with Six thoughts from MLS Week 5. Frank Dell'apa of the Boston Globe talks to New England coach Steve Nicol about all the rough play in the league so far this season. -I have been stunned at how brutal some of the games have gotten at times. Steve Davis on Daily Soccer Fix gives good grades to 2 new MLS coaches. Jack Bell of the New York Times gives us his impressions of new Red Bulls left winger Brian Nielsen. Thumbs up. Ryan Johnston of Sports Net sees Preki taking TFC by the scruff of the neck and dragging them to victory. Houston was hoping that last years surprise centerback Geoff Cameron could move forward and do the same thing in the attacking midfielder position, but this will now not happen as Cameron suffered a bad knee injury in their game against Chicago. Well, its bad - ruptured PCL and done for the season. -Jose de Jesus Ortiz of the Houston Chronicle with the full story. -So how do they replace Cameron who was replacing Holden who was replacing DeRosario? My guess is that Brad Davis slides inside with Cory Ashe on the left wing. But that is not the same. Word circulating around the globe this afternoon says David Beckman will not be healthy for the Galaxy this season as his achilles injury will not be healed in time. We shall see. Hey Fire fans, I don't care what the weather was like, you got outdrawn by Columbus! In the Chicago v Houston game the referee Ricardo Salazar proved he cannot keep a game under control by have to hand out 8 Yellow Cards and 2 Red Cards in 9 minutes!!! (79th-88th minute.) Just brutal. I am a Roger Torres fan! 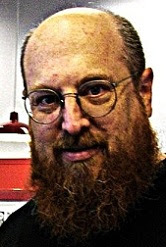 How come he keeps getting subbed out. Is Peter Nowak giving him the Freddy Adu treatment? New England must now always be included in the group with Dallas & Colorado for those who cannot sell tickets to see their team play. But at least New England get's decent newspaper coverage in Boston. Those other two get minimum word count. I will say this, I don't know who most of those guys who lined up for Toronto are, but its the second or third game in a row for most of them, and stability leads to success. They are still far from world beaters, but at least I knew what I was going to see as soon as I saw the line up on Sunday. For two teams who are struggling I sure found that Chivas v San Jose game entertaining, with the better team winning. And some amazing goals too, not to mention some surprising young players getting the job done for both teams: Blair Gaivn, Chukwudi Chijindu and Michael Lahoud for Chivas, with Brandon McDonald, Steven Beitashour and Ike Opara for San Jose. And what a smokin goal by Sacha Kljestan. Check the vid at the 00:36 mark. On the other hand, Kei Kamara had the weirdest miss I have ever seen (the ball did go in off his hand, but did he miss it with his foot??). I know I could have scored this one! Video, at the 1:25 mark. Michael Lewis of Big Apple Soccer wonders where everyone was on Saturday? Less than 16,000 showed up for the third league game at Red Bull Arena, and the team is winning. Plus it was beautiful weather outside. And it was against Philly! So what gives? Raul of Real Madrid messed up his ankle, so what does that do to his potential trip to MLS? Soccer 365's rumor page with word on Olof Mellberg and other goodies. All the best Open Cup info can be found right here at The Cup. Travis Clark of Soccer By Ives with a good review of the D2 Weekend. Not surprising after a few rounds that Vancouver and Portland are at the top. I don't expect anything else all season long. Puerto Rico and Montreal should be there are well. Another Win! 4 games and 6 points, I will take that! Stars beat Tampa Bay in their inaugural home opener. Yes it was classic bunker ball, but it was a win and a team that wasn't even alive 4 months ago is deserving of patience on how they get the job done. Upon reflection I am happy. 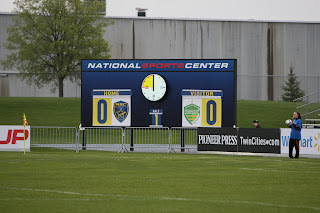 The NSC stadium looked sharp all around, including that incredible new scoreboard!!! I have to get a picture of it in action for all of you. Next home game is Wednesday, so how about then? Lot's of great game coverage in words and video on the first ever home game from Inside Minnesota Soccer. Jason de Vos of the CBC on Charlie Davies and any chances of him being healthy for the USA team. Martin Rogers of Yahoo Sports on the relationship between Davies and England's Ashley Cole, plus other World Cup Group C news. Rogers also wonders about the mental state of Jozy Altidore, with other news from the weekend. -I am not worried about his head. And neither should you be. The teams participation in the International Tournament of Gradisca (Italy) was canceled due to all the flight complication from the volcanic ash chaos. What an idiot: Jozy Altidore was tossed from the Hull City game on Saturday for a headbutt! Here is the video. And an article from the local Hull paper. -He has been given a 3 games suspension with only 2 left to play, so his career at Hull is effectively over. -Hull are also just a whisker away from relegation, needing to win both of their last two, while West Ham lose both of theirs. Maurice Edu & DaMarcus Beasley and Rangers have won the Scottish Premier League championship again! Edu played the full 90 in the big game while Beasley watched from the stands. -The Scotland Herald sees this team as "a good vintage." Marcus Hahnemann and Wolverhampton got the 1 point they needed to avoid relegation for this season. They are safe! Jonathan Spector and West Ham need 1 point from 2 games to guarantee safety. The regular season ended on Friday for Charles Kazlauskas and Helmond Sport in the Dutch Eerste Divisie (2nd division). They finished 6th which puts them in a spot for the promotion playoffs. Jay DeMerit is out of the Watford line up for another week with a stomach muscle strain of some sort. Not good. Odds are strong that Stuart Holden will resume full time training with Bolton this week. The regular season ended on Sunday for Freddie Adu & Eddie Johnson and Aris Thessalonika, but the team finished 5th which puts them into the 4 team playoffs for European cup spots next season. -The 4 teams play a full home and away round robin tournament to decide who goes where. Starts on Wed Apr 28. Benny Feilhaber - AGF Aarhus - played all 90, but got a yellow card, and lost 0-3 at home to Koge. Michael Parkhurst - Nordsjaelland - played the full 90 and they won 3-1 at home over Sonderjyske. Chris Rolfe - AaB - started but came off at half time in a 2-0 loss at Copenhagen. Jozy Altidore - Hull City - started but got a red card seconds before half time as they lost 0-1 at home to Sunderland. Clint Dempsey - Fulham - played the entire 90 minutes but lost 2-1 at Everton. Brad Friedel - Aston Villa - in goal as usual winning 1-0 at home over Birmingham. Marcus Hahnemann - Wolverhampton - went the distance getting a 1-1 home draw with Blackburn. Tim Howard - Everton - went the distance winning 2-1 at home against Fulham. Jonathan Spector - West Ham - played the full, but scored an own goal and got a yellow card, yet they won 3-2 at home over Wigan. Jemal Johnson - Stockport County - started and played 69 minutes as they lost at home 0-6 to Huddersfield Town. Eric Lichaj - Leyton Orient - played the entire game but lost 2-1 at Millwall. Jon-Paul Pittman - Wycombe - started and went 55 minutes in a home 2-2 tied against Swindon Town. Carlos Bocanegra - Rennes - played the whole 90 minutes as they drew 1-1 at Paris St Germain. Michael Bradley - Monchengladbach - played the entire match and tied Bayern Munich 1-1 at home. Steve Cherundolo - Hannover - started and went 85 minutes of another bad loss, 3-0 at Leverkusen. Ricardo Clark - Eintracht Frankfurt - went the full 90 as they drew 2-2 at Mainz. Eddie Johnson - Aris Thessalonika - started and played 60 minutes but they lost 2-1 at Olympiakos. Charles Kazlauskas - Helmond Sport - went the full 90 as they beat Emmen VV 2-0 at home. Dominic Cervi - Celtic - played the full 90 as they went to Hibernian and won 0-1. Alejandro Bedoya - Orebro - went the full match and won 3-0 at home over Halmstad. Ryan Miller - Halmstad - played the entire game but lost 3-0 at Orebro. Jose Torres and Pachuca pulled off a miracle and qualified for the Mexican Primera Liguilla where they will face #1 seeded defending champs Monterrey. Sammy Ochoa - Estudiantes Tecos - came on as a sub in the 74th minute as they won 3-2 at home over Atlante. Jose Torres - Pachuca - came on as a sub in the 55th minute as they won 1-2 at Puebla. Marco Vidal - Indios Juarez - played the entire match as they won 2-0 at home over UNAM Pumas. Yanks Abroad on Lyle Martin, the first American to play in China. In the Mexican Primera Division the 2 top teams in each group plus the 2 team with the next best records make the playoffs or Liguilla. The Guardian with Five things we learned from the Premier League this weekend. The Times with their 20 Best and 10 Worst signings in the Premier League this season. Phil Ball of ESPN Soccernet on the Liga relegation struggle, and a few other weekend mentions. Sid Lowe of the Guardian on the wild & crazy Getafe-Sevilla match, and all the rest of the weekend in La Liga. Gabriele Marcotti of The Times on the science, religion and mystery speculation surrounding Kaka's groin muscle injury. Inter regain the lead as Roma fall! Paulo Bandini of the Guardian on the Roman blunder, and the rest of the weekend in Serie A.
Gazzetta dello Sports with the Serie A Heroes & Zeroes of the weekend. Roma's 24 game unbeaten streak is now over. And Mario Balotelli apologizes. He actually sounds sincere. Rangers won their 53rd Premier League title over the week. Huge congrats to them. Ajax win what has to be their 11ty Millionth trophy, claiming the 2010 Dutch Cup. Ajax Amsterdam 2-0 Feyenoord Rotterdam - AA goals both Siem de Jong. A simple draw sees Independiente drop from 2nd to 4th just like that. May be a little early to hand Ajax the Dutch Cup this year. It went under-reported, but they recently decided to change the Final this year to a two-legged series due to security concerns. The 2nd leg is next week sometime at Feyenoord. well, we all know that MLS is considered a 'holiday' to top players around the world, so the question begs- which team, Alessandro? I don't see why anyone would worry about Jozy. He's usually a very calm and composed individual. NSC scoreboard= Win. Looks awsome. can't wait to see it in person.